Take Two claim illicit software has cost them half a million dollars. A U.S. court has awarded Take-Two Interactive a preliminary injunction to block software that helps players cheat at Grand Theft Auto Online, Reuters reports. 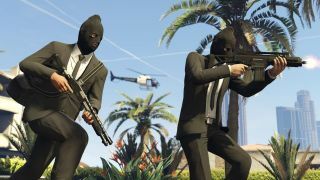 On Thursday, U.S District Judge Luis Stratton awarded the injunction against Georgia resident David Zipperer, who Take-Two had accused of selling two programs without the company’s permission, which provided players who used them an unfair advantage in GTA Online. The two programs in question are called Menyoo and Absolute. Both mods are what’s known as “trainers” and essentially allow users to alter a whole bunch of in-game parameters. They're vaguely reminiscent of Half Life 2's Garry's Mod, but can be deployed as cheat-enablers in a competitive game. The singleplayer versions of the mod were available to download for free, but users had to purchase the version that was functional with GTA Online. In addition to enabling griefing within GTA Online, Take-Two claimed that the mods had cost the company at least $500,000. The preliminary injunction prevents Zipperer from selling his software. It was awarded because Stratton believed Take-Two was “likely” to show that Zipperer had infringed GTA’s copyright, and agreed that the mods’ enabling of griefing had caused harm to the game’s sales by discouraging people from purchasing it. The punishment is not especially harsh, but Judge Stratton believed it was “appropriate” as Zipperer cannot afford damages. Zipperer’s lawyer did not immediately respond to a request for comment. Take-Two said in a statement, however, that it will continue to pursue legal action to prevent “disruptions” to GTA Online. Take-Two has come down hard on the GTA V modding community in the last year or so. Menyoo was forcibly shut down alongside Force Hax last year, while modding tool OpenIV shut itself down after receiving a legal notice from Take-Two interactive.